If you are looking for information on the 911 Driving School franchise business opportunity, 911 Driving School franchises or 911 Driving School franchising, then you have come to the right place. 911 Driving School is an exclusive driver's education program that hires only the finest police officers as instructors. The officers' knowledge and expertise prepares students for the great responsibility that comes with obtaining a driver's license. The most important aspect of driver's education is SAFETY and we think that the best safety device you can install in a car is a well-trained driver. Police officers are highly trained in every aspect of controlling a vehicle and are able to teach the latest in defensive driving techniques. They are also required to stay up-to-date on all the current traffic laws. This knowledge is passed on to students and provides them with the skills necessary for safe driving on today's roads. 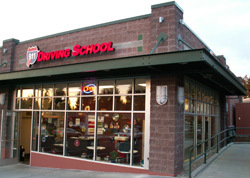 At 911 Driving School, we are committed to giving our very best to each and every student. Our desire is to teach the skills that will last a lifetime. It is in our personal interest to create safer streets to travel on...our families drive on the same streets. Teen Driver's Safety Education & Certification: We offer a variety of Teen Driving programs to meet the needs of all students including a basic course, a conventional course and an advanced course. Defensive Driving School: We offer a couple of options for experienced drivers to improve their knowledge and understanding of local traffic laws and is great for drivers who have received a traffic infraction or are looking for insurance discounts. Adult Driving: This course is recommended for the driver needing more training and includes behind-the-wheel, first time adult driver and other customized training programs. Mature Driver's Training & Education: For anyone 55 years and older we offer the opportunity to attend Street Survival: A State Approved Driver Refresher Course which covers current rules of the road as well as how to adjust to environmental and age related changes. We are excited to offer 911 Driving School Franchise opportunities to individuals. If you are interested in owning a 911 Driving School franchise, please complete and submit the form below and we will be in touch with you. We look forward to hearing from you.